The Hearing Impaired Girl Asked Me If I Was F%*#@$g Deaf! 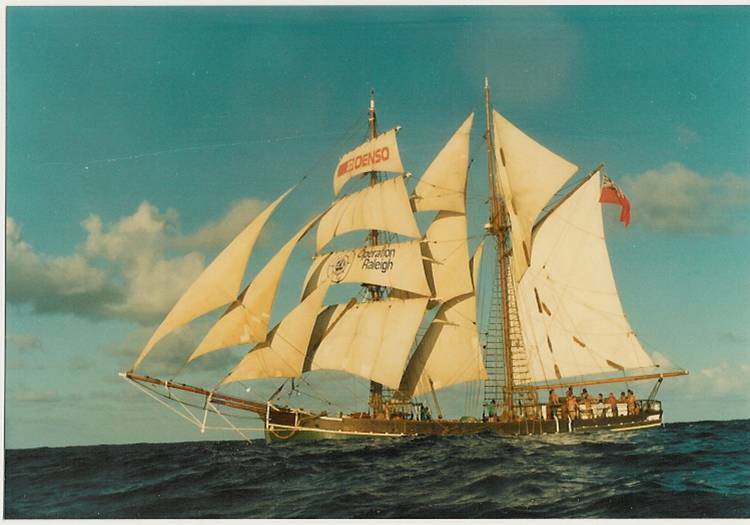 It was August 1987, and I was working on a sail training ship called Zebu. It had 7 crewmembers and 15 young sail trainees from all over the world. The trainees would rotate at three-month intervals. The ship could hold 13 sails, and there were approximately 150 lines (ropes) controlling the sails and yardarms (the horizontal wooden poles holding the square sails). It was on a four-year, round- the- world expedition as part of Operation Raleigh, and I was on board for 12 months traveling fromAustraliato the Caribbean viaAfrica. I was the engineer and electrician, and also assisted in sail training. When I first joined the ship, I met one of the sail trainees who happened to be deaf. She lip read and spoke with a very nasal tone, the same kind of tone and intonation I had heard other deaf people speak with. She said something to me but my ears and brain could not decipher her meaning. I asked her to repeat herself, she obliged… but I still could not understand her. After asking her to repeat herself three times, I could see she was getting frustrated and she angrily shouted at me, “What’s wrong with you…..are you f%*#@$g deaf? !” I completely understood! While on this magnificent sailing ship, all the sail trainees had the opportunity of being certified as a sailing ship “Competent Crew” and “Watch Leader.” It took 2 to 3 months for them to learn the 150 lines, to be able to shout out detailed sailing orders to the people on deck, up in the rigging, and also to navigate using compass, sextant, and navigation charts. The various nationalities on board for the 12 months I was on this sailing ship included Ireland, England, Scotland, Wales, France, Canada, British Guiana, New Zealand, Australia, Japan, and America. With this multi-cultural group of people, we all had to learn to tune our ears to the different accents. Even more important, we had to learn to try to moderate our accents, sharpen our pronunciations, and reduce any country specific slang. This was to make sure the sailing orders we were shouting out to each other were crystal clear. To put this into perspective, this ship had 13 sails and people were climbing 80 feet up into the rigging. High in the rigging, we stood on ropes adjacent to the horizontal yardarms while furling and battling the billowing sails. This was even done while the ship was rolling in bad weather and being 80 feet in the air was like being on an out of control roller coaster ride. Misinterpretation of a sail order could easily have resulted in someone getting seriously hurt. It did not take long for people to acclimatize to each other’s accents, but not before we had some funny moments that had us looking at each other. One of the most memorable ones was a sail order shouted out by a Japanese youth, “Whore on the harriard” (haul on the halyard)! The photo above was taken after the sail trainees had been on board three months and they had become expert sailors. The ship was under full sail and the fluid movement of the sails being maneuvered was testimony to the level of competency they had achieved. The communication amongst the sail trainees was fluent and flawless. Fast forward over 20 years and communication with people with foreign or distinct accents is still an important part of my life. While conducting my workshops on “Presentation Skills for Technical People”, I have been blessed to have participants from all over the world including Canada, USA, Ethiopia, China, India, Pakistan, Hungary, Congo, Mexico, Scotland, and England to name a few. A common question I get asked by people with strong accents is, “Does my accent put me at a disadvantage when I am presenting?” The answer is yes and no. It really comes down to whether your audience can clearly hear you and comprehend what you are saying. If you are having a hard time getting your message across in presentations and in meetings due to a strong or distinct accent, what can you do? Before I provide some advice, let me state that I love great speakers, particularly ones that have a rich distinguished accent that illuminates their content. The important thing to remember is that the audience needs to be able to hear you clearly and they need to be able to understand what you are saying. In my opinion, if you strive for presentation skills excellence and you also have those attributes, then an accent can be a benefit- it gives you uniqueness. What is amusing for me is when you have people who learned English in their home countries from an English-speaking teacher and they have picked up some of the teacher’s accent and even slang. Slow down your rate of speaking and use purposeful pauses. Give the audience’s brains a chance to catch up and piece the sentence together. If you have a strong or distinct accent they may not understand some words you say, but the words they do understand will help them figure out what you mean. Project your voice so that everyone in the room can clearly hear your voice. When you give a presentation, have someone in the room taking notes to give you feedback on any mispronunciations. This little-steps approach will help hone your skills. This can also be done in your day to day workplace activities. Tell coworkers what you are trying to achieve and solicit feedback from them. Develop a list of words you have trouble pronouncing and focus on rectifying them. Read aloud to practice your pronunciations and the rhythm in the sentences. Determine what your specific needs are beyond the aforementioned items. Final Note: I consider myself to have a very mild Irish accent; however inTexas, when I introduce myself as “Dave Hill”, nine out of ten times they ask me to either repeat my last name or spell it out. This has been happening for 14 years. I happened to mention this to a university teacher last year and she smiled. She said, “If you want them to understand your last name, you need to tell them your name is Dave Heeeeel! I was skeptical about the advice she gave; however, once I tried it out, it worked 100% of the time. Who would have thought!